With a stay at Montage Deer Valley in Park City (Deer Valley), you'll be within a 15-minute drive of Main Street and Deer Valley Resort. 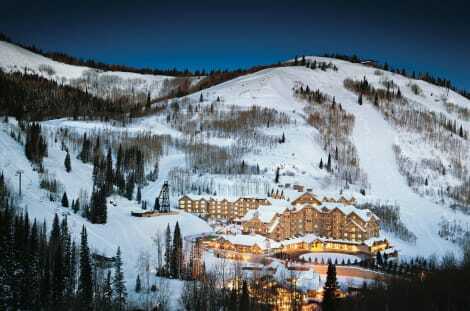 This 5-star resort is 5 mi (8.1 km) from Park City Mountain Resort and 8.6 mi (13.9 km) from Canyons Resort. Stop by the hotel's restaurant, The Mountain Grill, for lunch or dinner. Dining is also available at the coffee shop/café, and room service (during limited hours) is provided. Quench your thirst with your favorite drink at the bar/lounge. Cooked-to-order breakfasts are available daily from 6:00 AM to 10:00 AM for a fee. Spend the day on the slopes, or enjoy recreational amenities including an outdoor pool and a spa tub. Spend the day on the slopes, or enjoy recreational amenities including an outdoor pool and a 24-hour fitness center. Additional features at this lodge include complimentary wireless Internet access, concierge services, and a fireplace in the lobby. Guests can catch a ride to nearby destinations on the complimentary area shuttle. Make yourself at home in one of the 82 air-conditioned rooms featuring DVD players. Complimentary wireless Internet access keeps you connected, and cable programming is available for your entertainment. Bathrooms have shower/tub combinations and complimentary toiletries. Conveniences include coffee/tea makers, housekeeping is provided weekly, and microwaves can be requested. Make yourself at home in one of the 135 air-conditioned rooms featuring microwaves and DVD players. 27-inch flat-screen televisions are provided, with cable programming available. Bathrooms feature shower/tub combinations, complimentary toiletries, and hair dryers. Conveniences include phones, as well as safes and separate sitting areas. Satisfy your appetite at the condo resort's coffee shop/café. Make yourself at home in one of the 63 air-conditioned rooms featuring refrigerators and microwaves. Your room comes with a pillowtop bed. Rooms have private furnished balconies or patios. Cable programming and DVD players are provided for your entertainment, while complimentary wireless Internet access keeps you connected. Private bathrooms with shower/tub combinations feature complimentary toiletries and hair dryers. Enjoy a meal at the restaurant, or stay in and take advantage of the condo's room service (during limited hours). Wrap up your day with a drink at the bar/lounge. A complimentary hot/cold buffet breakfast is served daily from 7:00 AM to 10:30 AM. Make yourself at home in one of the 55 air-conditioned rooms featuring refrigerators and microwaves. Flat-screen televisions with cable programming provide entertainment, while complimentary wireless Internet access keeps you connected. Bathrooms feature bathtubs or showers, complimentary toiletries, and hair dryers. Conveniences include coffee/tea makers and irons/ironing boards, as well as phones with free local calls. Featured amenities include a business center, complimentary newspapers in the lobby, and dry cleaning/laundry services. Planning an event in Park City? This resort has facilities measuring 26,384 square feet (2 square meters), including a conference center. lastminute.com has a fantastic range of hotels in Park City, with everything from cheap hotels to luxurious five star accommodation available. We like to live up to our last minute name so remember you can book any one of our excellent Park City hotels up until midnight and stay the same night.